Stuzzichini at an aperitivo bar.I'm not talking about dine-and-dash here, or flirting your way to having someone else pick up the check. These are two absolutely legitimate ways to eat for free in Italy—and since one method is available around dinnertime and the other combines breakfast and lunch, it is possible (on occasion) to go a full day during which pay nothing for three square meals. Apertivi ("aperitifs") is a simple idea: basically, it's Happy Hour with free nosh. Starting at the end of the daily see-and-be-seen passeggiata strolling hour(s) between the end of the workday and the start of dinner, many bars and cafes in town will lay out stuzzichini (little snacks) to draw in patrons. These aperitivi usually run from 7pm to 9pm or so. The phenomenon started in Northern Italy (most people say in Milan, but I swear I encountered it in Turin years before I saw it in Milano), but happily has recently spread to Rome and other Italian cities as well. In some cases, the fare is just basic bar snacks (olives, nuts, and salty crunchy things in the chips/crisps family), but an increasing number of downtown bars—especially trendy ones—load down the bar or long tables with dozens upon dozens of mouth-watering canapés, tapas, and tidbits. You'll find trays piled high with salamis and cheeses, tiny pizzas, various pates and cured meats atop rounds of bread, fried rice balls gooey with mozzarella, grilled veggies, stuffed frittate (a cross between an omelet and a quiche), pretty much any food you can spear on a toothpick, and all sorts of pastries, tortes, and cookies. Bar-hop your way from one cafe to another and you can easily make a full meal out of it. Best of all, it's all absolutely free (except in Venice, where they've been doing this for decades, calling it cicchetti and charging a nominal €1 or so per snack). I mean, they expect you to order drinks as well, but no one slaps your hand away from the food platters if you're not holding a glass in the other hand. I do, however, "splurge." I order something to drink at each bar to accompany my stuzzichini, rending my meal, technically, not free. When I have wine and snacks at one bar, wine and snacks at a second one, espresso and desserts at a third, I'm stuffed—and all dinner cost me was about €5–€8 in vino and coffee. 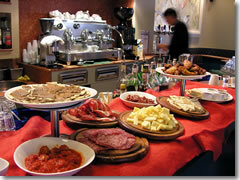 The best and latest hotspots for snacking in any Italian city change regularly. I find pretty good luck just wandering the downtown streets in search of crowded bars. However, you can find lists of good snacking cafes at the following websites. ToNight.eu (www.tonight.eu) - Network of dining/nightlife guides to 16 European cities, including Rome, Florence, Milan, Genova, Verona, Turin, Bologna, and Brescia. Those links should take you directly to the aperitivo section of each city, but in case they change it: within each city guide, click on "Venues", then, under category, select "Apertivi" (filed under the "bere" section). NottiDaLeon.it (www.nottidaleon.it) - Nightlife guide covering aperitivi spots in Milan, Rome, Florence, Naples, Bologna, Turin, and Verona. Aperitivi in Rome: www.romaexplorer.it, NottiDaLeon.it, QuiRoma, Roma C'é (Rome's main events/nightlife magazine, available at newsstands; the website does list aperitivo bars amongst the "Nightlife&Locali" section, but alongside live music venues and regular cafes, so you have to root around for them). Yes there is such a thing as a free lunch, provided you view the breakfast buffet at the hotel as a supply line for picnic pickings. The way I see it, if the hotel insists you have to buy their breakfast (which is the case when they say breakfast is included in the room rates and you can't get a discount for ditching it), you are fully within your rights to (discreetly) raid it for a picnic lunch later. So go ahead: grab an extra roll and a few slices of cheese and ham or salami to assemble a quick sandwich back at your table. Double-wrap it in some napkins, add a piece of fruit or two and maybe a pastry, drop it all in the daypack you brought with you to the table, and you'll be ready when lunch rolls around. Two meals for the price of none!